"Laundry systems that will revolutionise the local tourism sector use 80% less water and can save up to 22 000 litres per guest room in water consumption annually"
Fanute is the sole distributor for Xeros near-water less laundry systems in South Africa. It is a technological innovation in laundry systems that results in savings of up to 80% in water and 50% in electricity and is now available in South Africa, promising sustainable solutions for the hospitality sector. Furthermore, these systems can provide welcome relief for laundries and hotels to reduce their water consumption. While Cape Town’s Day Zero was narrowly averted, the South African hospitality industry remains forever changed and the quest for innovations that help reduce water and energy consumption has begun in earnest. From desalination plants to leak detection and control mechanisms, South Africa is turning to technology for answers. 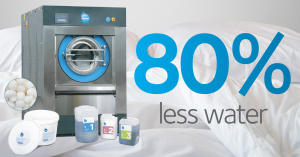 Utilising ground-breaking technology to replace 80% of the water conventionally used in a washing machine with polymer XOrbs, the near-water less laundry system simultaneously produces superior cleaning results. The Xeros laundry system replaces up to 80% of the water used in traditional washing systems with polymer XOrbs™ which gently massage textiles to provide superior cleaning results as compared to conventional aqueous washing methods. By combining the molecular structure of the XOrbs with a proprietary detergent solution, dirt from soiled items is attracted and absorbed by the XOrbs, producing cleaner results in ambient water. A single 25 kg machine saves up to two million litres of water a year and reduces energy consumption by up to 50%. Added benefits include the life of linen being extended due to lower temperatures and a reduction in detergent, both of which translate into bottom-line savings. This innovative washing system, which is being imported by local company Fanute, has the potential to revolutionise the local tourism sector, and is being showcased at The Hotel Show from 24 to 26 June at Gallagher Convention Centre. See Fanute from 24 -26 June 2018 at Gallagher Convention Centre.